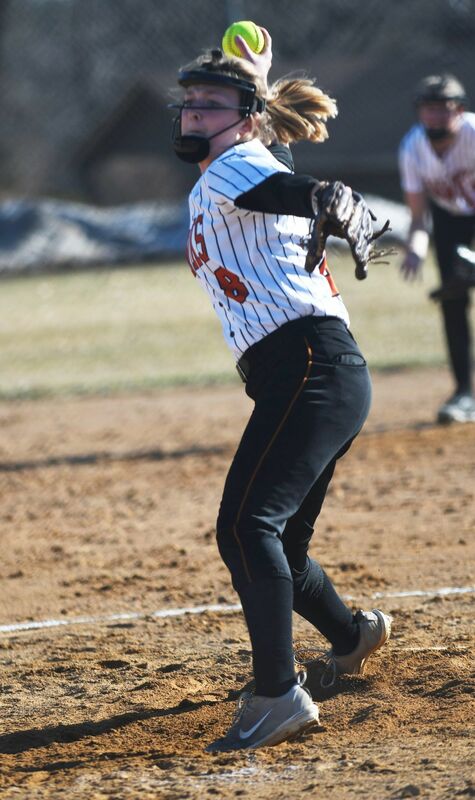 Bloomer’s Calley Olson pitches the ball against Eau Claire North during the Blackhawks’ 7-0 victory on Monday. Eau Claire North's Mackenzie Gilbert pitches against Bloomer on Monday. Freshman Calley Olson had Eau Claire North batters baffled all afternoon, striking out 11 en route to 7-0, complete game shutout. On a windy afternoon, her riseball was confounding. The gusting wind, coupled with her funky delivery that hides the ball from the batter, had the Huskies off balanced. “I’m not really on the power line, my foot is kind far off of it,” Olson said of her delivery. She allowed just two hits, both singles, and it wasn’t until the seventh inning, when Abby Mowl hit a fly ball to left field, that Olson allowed a ball out of the infield. Both Mowl and Taylor Wolter, who hit an infield single in the second inning, never reached second base. Olson helped herself out in the first inning, opening the game with a lead-off walk. Two batters later, she scored on a two-run double from senior Rilee Luzinski. The run would end up being the game-winning run for the Blackhawks, part of a three-run opening frame that proved more than enough. It was a tough hole for the Huskies to find themselves in in their first game of the season. Junior Mackenzie Gilbert pitched well for North, but her defense struggled, making nine fielding errors. The Blackhawks added another run in the second, when Ashley Poirier was cashed in by Kenadi Poirier, who hit a fly ball to right field that Sadie Seymour couldn’t corral. Three innings later, Samantha Buckholtz scored on a passed ball to give the Blackhawks a 5-0 lead. They added two more insurance runs in the seventh when Wittrock and Nicole Breu came around to score the final two runs. The Huskies return to the diamond tomorrow as they head out to River Falls to take on the Wildcats at 5 p.m. Bloomer returns home where it will take on Thorp at 5 p.m.